Description: A very remote area which has been the centre of some renewed interest. 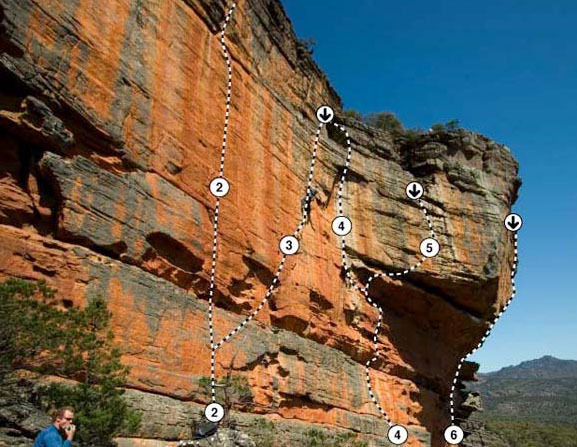 The spectacular Flame Wall has some excellent steep sport routes on gorgeous orange rock. Location: 700m North of Grahams Creek crossing on Harrop track a cairn marks the walking track. Good Friday Walls is the orange north facing crags visible above the tree tops from the road. Diseased Wall is the south facing large grey wall to the left (north) of Good Friday Gully. Flame wall is the bright orange block on the right (south) of Diseased Wall beyond Good Friday Walls. Follow the marked track for about 5 minutes to an old vehicle track and cairn. Turn right, walk about 20m then left again to continue across the hill to cross creek. The track continues up then across rocky slope, following cairns to Good Friday Walls. Walk west along base of this wall and up over the hill until you see Flame Wall in the distance. 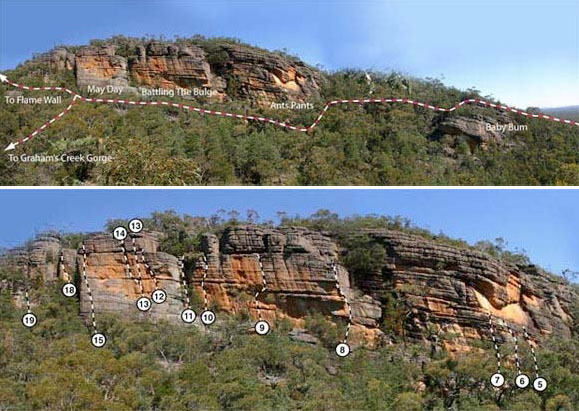 Follow cairned rock shelf south and down into the creek and up the other side to eventually arrive at Flame Wall. A worthwhile excursion when returning from Flame Wall is to follow down the creek bed and into the gorge proper and then back up to Good Friday Wall. If the creek is flowing strongly the slippery ramp below Rock Lobster can be avoided by a keyhole on the right leading into an amazing bouldering cave. Description: A pleasant north facing series of walls reminiscent of Gilhams Crags. Most of the routes are vertical and require wigglies. A few bolts exist on some of the harder faces but this is the exception. The wall blazes in the sun all day long. Avoid in summer. Location: A cruisy 30min walk will get you to the crags. All routes are described right to left when facing the cliff. The first climbing is hidden away below the walking track. A cairn marks the descent of about 30m to the Baby Buttress about 50m before Ants Pants. The climbs here may provide light entertainment. The main wall you reach after the Baby Buttress gully has a large termite nest on the ground. Several brooding steep cracklines break through what is mosty smooth and blank. Descent anchors have not been placed yet. Currently descent is via a dodgy roped boulder up and right to gully. Walk around left from Celebrity Rooter and scramble up onto shelf below impressive north facing orange wall reminicant of Arapiles. On the far right side is a bulging arete with a crackline start, this is The Lying Rodent. To descend off most routes you need to scramble off this detached pinnicale and walk to the far left end and down via May Day's descent gully. The next routes are on the 'main wall', which is just left of the Ralph's Journey. It has a slabby juggy grey start and 15m of nice orange rock to finish. You can easily descend via the left side (east) side and down a short squeezey gully. The next routes start back on ground level. 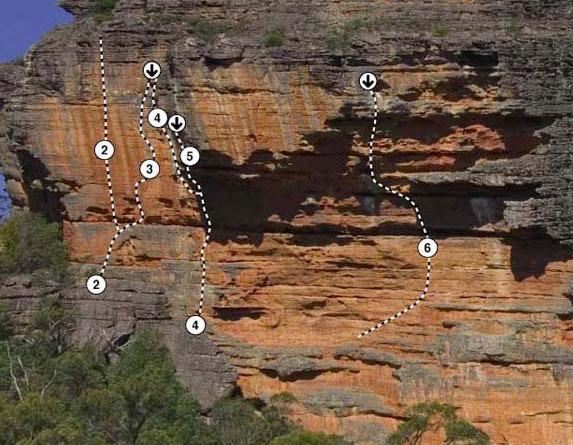 About 10m left of Flying Possum and below Poets Corner is an 8m vertical wall (Gay Welders Wall) with a few very short routes. Description: A few nice wall routes in an attractive water side setting (in winter). Location: Down below Good Friday Walls is Graham's Creek. Upstream by about 50m from Napalm Sunday is this beautiful little gorge, with cliffs rearing up on both sides. The southern side has the climbing.The best access is by scrambling down the very steep slope below Napalm Sunday following rock cairns. It is about a 2 minute walk from Good Friday Walls. 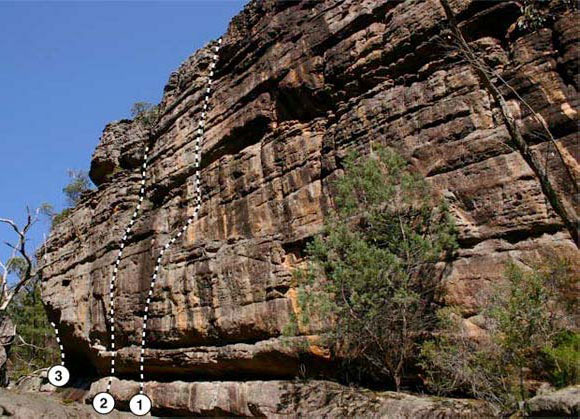 Pitch 1 (18m, 19) : Climb the overhanging finger crack and traverse left to a ledge. Pitch 2 (10m, 14) : Easily up corner. Description: An outstanding orange prow of jutting sandstone that requires a long and taxing approach. Unfortunately the centre of this formation is either too steep or too blank for mere mortals. Perhaps the next generation will take advantage of some of the incredible potential of this area. In the meantime you can enjoy some very nice face and roof routes on either side of the main prow. Climbers have been sniffing around up here for decades. In early 2003 Neil Monteith and James Pfrunder hiked up in the pouring rain and brought back photos of the main wall dubbing it the Graham’s Creek Supercrag. They were however put off by the long approach walk, and the apparent blankness of much of the face. The sheer size and angle was enough to impress others who soon made their move. In 2005, the Yerba crew cut a path up the creek from the nearby Good Friday Wall and set about bolting the unlikely roof climb Out Of Control (24). Robin Holmes dragged several assistants in to help in his two day marathon bolting effort. Eventually he returned for the redpoint and brought in Neil Monteith and Will Monks. Neil got excited and worked furiously to bolt the steepest thing that looked possible, with Flaming Lips (26) being the end result. 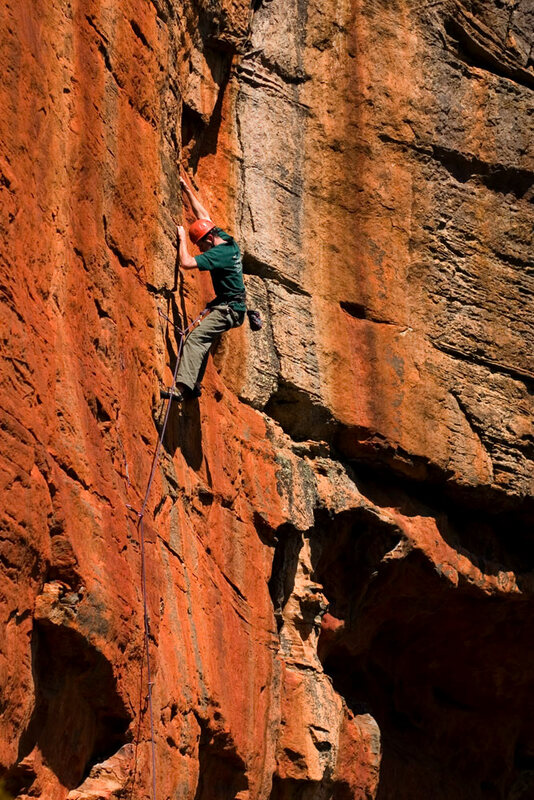 Steve Chapman optimistically bolted a very thin face route that was steeper than he thought upon redpoint attempts! This route might have to wait for a super hard man. In the meantime Will Monks got given a nice partially bolted project on a platter by the Yerba crew. 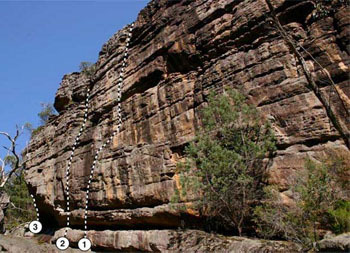 This route had to wait for more than six months before it was finally climbed as Slow Burn (23). Earlier in the year Steve Chapman also tradded his way up a thin crack variant to Out Of Control to produce Edge Burner (23). In late 2005 Malcolm Matheson did his usual and onsighted all established routes in a single day, including a drawn out battle with the pumpy Flaming Lips. Location: All up the approach takes about an hour from the road. If you are as enthusiastic as Neil you might get this down to 40 minutes. Walk into Good Friday Wall. From the far left (uphill) end of this crag keep following rock cairns and tape markers up over the hill (just south of the gorge) to arrive on rocky plateau with clear view east towards the proud Flame Wall. Walk right (south) along these rock shelves following large cairns and tape to eventually drop down into the small creek (runs for 8 months of the year). Cross this, and hike steeply up the other side to arrive at the base of the wall. For all the routes you scramble onto a friendly ledge, from the left side, that offers good sun-napping locations for belayers. The wall faces into the sun for most of the day with shade only in the early hours of the morning. Flaming Lips is in shade until midday. Rain protection is minimal if you get caught this far out without an escape plan! Description: Home of the mega jug. One of the largest bits of rock in the Grampians, but totally lacking in any sort of inspiring climbing for the most part. Location: 122693, 612869. From Flame Wall bush bash north towards the towering choss pile of Diseased Wall. It is an easy 5min thrash. To descend (epic) walk back and left (west) across rock until you can climb down a few metres, then walk left (west) towards treed gully looking for cairn at top of small wall. Scramble down short face and then down scrub gully to bottom. Pitch 1 (40m, 7) : Climb mossy rock to ledge. Pitch 2 (40m, 7) : The gutter above is clean and has the biggest jugs that you will ever see. 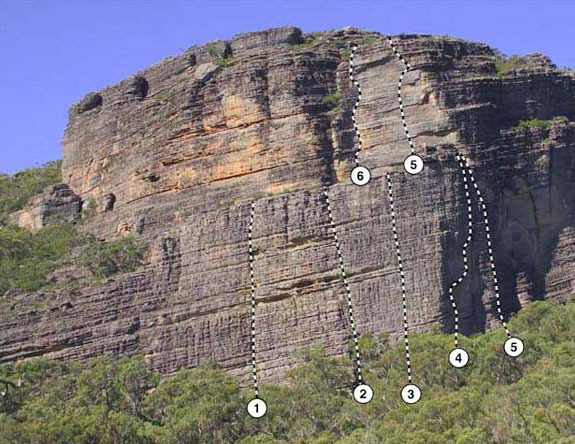 Pitch 1 (30m, 18) : Climb the corner to the first roof. Pitch 2 (10m, 19) : Go right under the first roof and belay just above. The footholds on this pitch are very mossy! Pitch 3 (20m, 20) : Jam underneath the next roof (crux) and up the corner to a brilliant belay beneath the third roof. Pitch 4 (10m, 17) : Continue up and traverse under the next roof. Pitch 5 (30m, 10) : Climb the stegosaurus wall to the Operating Theatre. 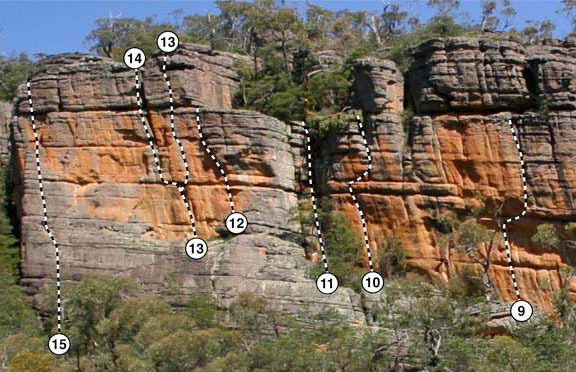 Pitch 1 (40m, 12) : Starts 12m right of Spinal Column. Wander up middle of wall on good jugs to small belay stance. Some loose rock. 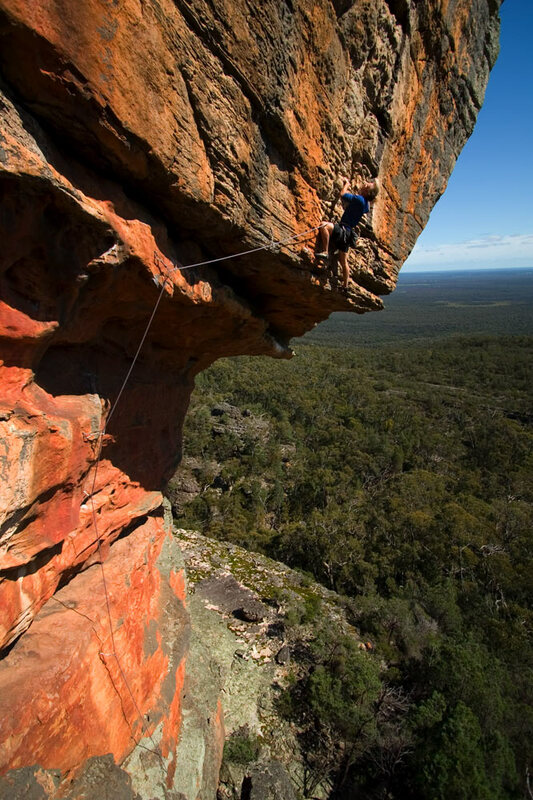 Pitch 2 (30m, 13) : Continue up face to belay ledge level with Operating Theatre (this is the same belay point at the end of Spinal Column). Walk 20m left behind block to Operating Theatre Ledge. Pitch 3 (20m, 21) : Hard start up behind tree and good moves up middle of face on slopers and small edges. Continue up to small ledge. Pitch 4 (15m, 19) : Head up overhanging wall to large horizontal break then traverse right to arête and up. Harder direct finish is possible but needs bolt.